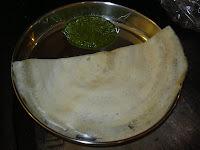 Dosa is a very common tiffin in south India. Most of us know the recipe for making dosa. This is especially for my friend Sangeeta. Here is the recipe. Soak rice and urad dhall for atleast 6 hours. Add fenugreek seeds to urad dhall while soaking. After 6 hours, drain the water and grind urad dhall first nicely. Then grind rice very nicely and mix both together. Add required amount of salt and mix everything well. The consistency of the batter should be a little more watery than idly batter. Add water to adjust the required consistency. If you want to make dosa in the evening, you prepare this batter in the morning and keep it outside (some people may not prefer sour batter. so they keep it in the fridge immediately after grinding). I prefer a little bit sour batter to make dosa. 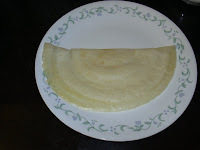 If you are ready to make dosa, then preheat dosa skillet and pour a laddle full of batter and make a circle according to the size you prefer ( I make 3" to 4" diameter dosa for my girls and for us 6 to 7") Pour 1 tsp of sesame oil (preferably) on the side and let it cook under low flame. Flip it and let the other side also cook. Adding oil on the other side is optional (I usually avoid). when both sides are fully cooked, serve it hot with some chutneys or sambar. Thanks Vid...I will prepare this tomorrow.....let me see whether, after such long time, I would be able to make this. Sangeeta, try this and lemme know how u prepared it. Thanks anisheetu for the award.